Do/Panic is is a student project realized by Tobias Ellinger and Philip Oettershagen and supervised by Marc Hassenzahl and me. It is about order. Now and then, Do/Panic suggests tidying up a bit by occasionally projecting a grid and other visual aids on your desktop. It divides the desktop into several areas. It offers some grids and lines, relying on the power of this simple prompt. Because a simple beam of light is enough. People take up this little advice and start to align their stuff with the stripe. But sometime you cannot gather the energy to tidy up. Do/Panic acknowledges that it is difficult to do always the right thing. Instead of tidying up, it is possible to disguise the chaos with a superimposed pattern by pressing the panic button. The mess disappears – at least for a while. 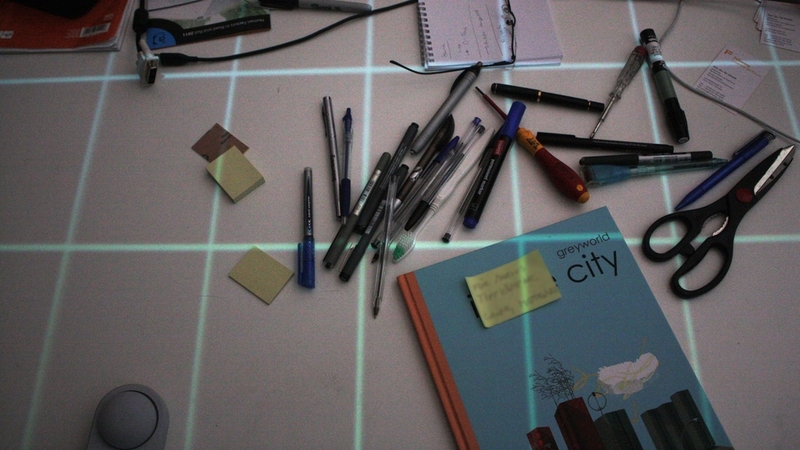 We were invited to present our Transformational Objects and Do / Panic at the e-culture fair 2011 in Hasselt, Belgium. Here are some impressions of the fair.